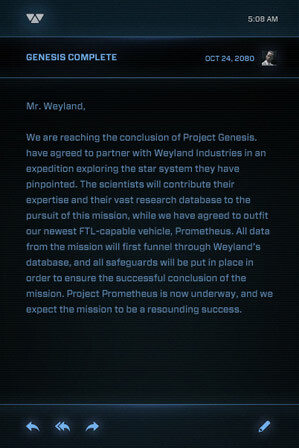 To start ending the viral for Prometheus operating under Weyland Industries, Fox has distributed clues around the web for one more event unlock called Project Genesis in connection with Project Prometheus. We have one of the numerous clues for locations to unlock on a globe that Dr. Shaw is researching to finalize details. She's the one looking for all the connected patterns that point to a star formation, and this must be their final project before launch. There seem to be over 30 locations on here, so we're currently providing our clue (below) and collecting as many others as we can to see what Project Genesis unlocks. Follow along! Our clue - Location 002: Best place to see the seven sisters in the western hemisphere? Central America, of course! #Prometheus - http://po.st/DYgnNE Follow on twitter or click to the Project Genesis website. 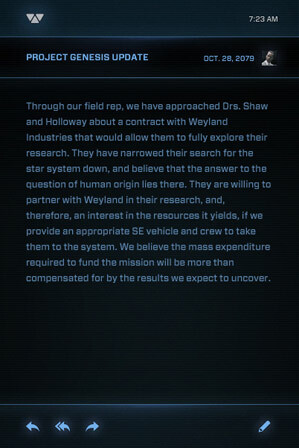 The information on the Project Genesis website states: "Weyland Industries has contracted Dr. Elizabeth Shaw to help further her groundbreaking research on anthropological traces of a shared human origin. This stage of research requires outside agents to assist in the search for artifacts and sites from a variety of cultures that support her hypothesis." 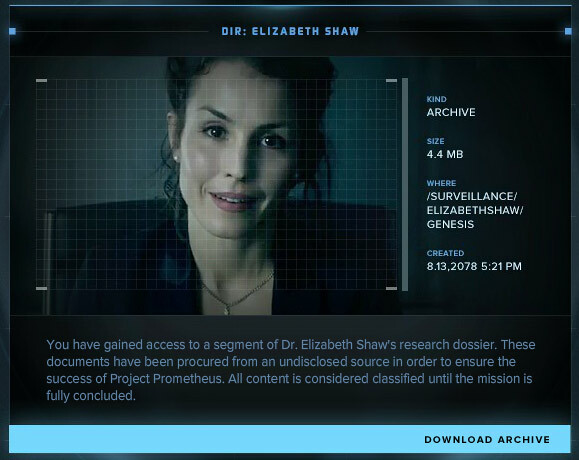 Dr. Shaw is played by by Noomi Rapace, who was featured in her own viral video recently, seen pleading to Peter Weyland. It seems like all of this has come full circle and is finally coming together with Project Genesis, the "beginning" of the next chapter, to end this viral, so to say. 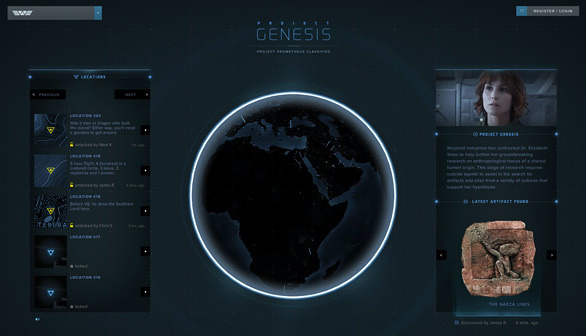 We'll keep you updated on what happens with Project Genesis once all the locations are found. Any ideas? Update! 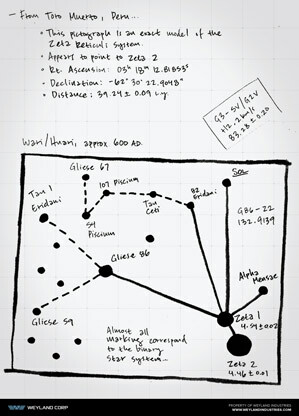 After completing the global location search, the page shows a final message from Dr. Shaw, which links to an archive of files to download. 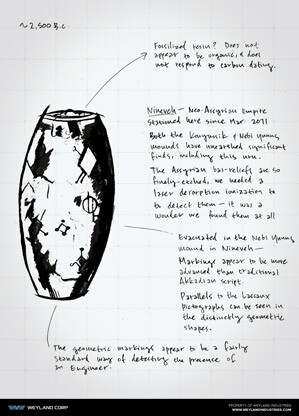 They contain even more clues, likes pages from Shaw with drawings. 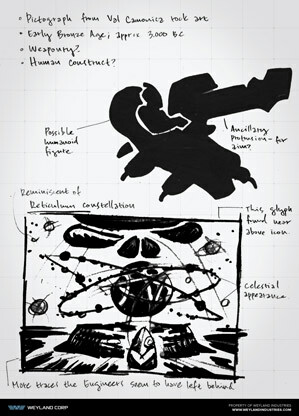 The file also contains Shaw's notebook pages, which have some very detailed notes that link to Prometheus. That seems to be the biggest update for now, linking everything from Weyland and Shaw's involvement to everything (and the questions) in Prometheus, which finally hits theaters tomorrow. We can't seem to see if there's more to this, or if this finishes the viral. 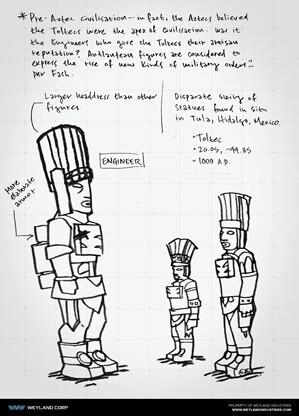 According to Unfiction, there were some recent updates with concept art (see PrometheusForum.net) but nothing major has come out of these new archived notes from Shaw. We'll continue to keep an eye on things, in case there are more clues hidden in these materials. Click to the Project Genesis page above to download them all yourself. And go see Prometheus if you haven't yet! My anticipation to watch this film has me pumped, tomorrow will finally be the day it's to see if all the hype and all the awesome viral leads to a great film. Ah, I thought this was for the second movie. Have fun Fidel, it's good to look at for sure, I loved some pieces was a bit put off by others, but I'm sure when the 13 hour long directors cut with commentary by Lindelof and additional support manual written by Scott it'll make the viewing experience complete. Thanks for the heads up, I'm going to go watch it in a while. I dont understand the Weyland site pages. How do you actually act on clues once you put them together? For example is there an input field to enter locations?